Our customers have lovely things to say about our cakes. We’d love to hear from you about your cake too. Leave us a review below! The cake was fabulous and was enjoyed by everyone. Will definitely recommend The Cakery to family and friends. I just wanted to say thank you for the cake. It was amazing and looked so luxurious...everyone was amazed it was eggless and still tasted so good! On behalf of our family we would like to express our utmost gratitude to you and your superb, professional and helpful staff for providing us with a very memorable and a scrumptious cake.My nephew was so overjoyed and delighted that he couldn't stop admiring the details on the cake. The Cakery moved mountains to help me get an awesome cake quickly. Customer service is excellent, prices are good and the cakes taste gorgeous! Delicious cakes! Best I have ever tasted! Would definitely recommend The Cakery to anyone! Our wedding cake was beautiful and the taste was to die for. Thank you very much!We'll be coming back for more in future!! Caroline has been making cakes for my family for last 26 years and she really came up trumps once again for my husband’s 60 birthday cake with gardening theme. Thank you to the whole cakery team for delicious cakes and great service. I have been getting cakes from Carolyn since 1992 and now my family and friends all over England have the cakes from the Cakery. We all refuse to have our cakes from anywhere else. The Cakery has the most delicious cakes and the best customer service. No request is too big for them and every cake exceeds our expectation. I would like to say a big thank you to Gemma and the team for creating beautiful cupcakes for our baby shower. Service along with presentation and quality of my order was amazing. I would highly recommend. The Cakery made and decorated the most amazing wedding cake. It tasted divine and looked stunningly beautiful, with pale pink iced roses and pale pistachio green icing. I was blown away when I picked it up. Everyone said it was the best cake they had ever eaten and it was sold at a very reasonable price. I had been researching cakes for a while and The Cakery beat everyone! Thank you so much for your wonderful creation! Thank you for the gorgeous cake you made for my mother-in-law's 80 th Birthday. It looked beautiful and tasted great. Really pleased. I ordered at short notice, a large vanilla sponge with buttercream and jam filling and icing that wasn't rock hard as with many celebration cakes. Not only was the design exquisite and the icing exactly as I had hoped but the cake itself which had three layers was moist and delicious with lovely butter cream and jam filling. The Cakery is now our 'go to' bakery for celebration cakes. Ordering our wedding cake from here was a no brainer. 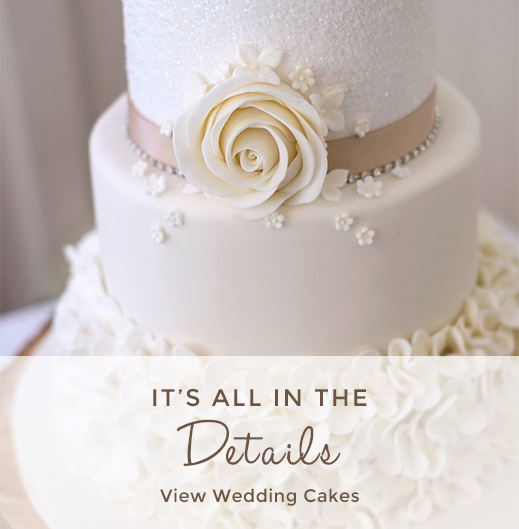 The Cakery were so helpful when we came in for our cake tasting and the cake looked beautiful sitting in the room during our wedding breakfast. The cake was delicious, 5 weeks on and our guests are still talking about it! Thank you so much Cakery Team for another fantastic cake. Beautiful two tier (pink and lilac) 70th birthday cake for my Mum which she absolutely loved as did the whole family! Wonderfully moist and so delicious, especially the lemon sponge, we'll be back for more! Thanks again! I ordered a cake with a Mini Cooper design on the top for my son Robert's 18th Birthday. The design created was fantastic and the car very detailed, included his personalised number plate! In my son's words it was "awesome". Not only was the design wonderful, the chocolate ganache cake itself was a lovely texture and delicious. Thanks to Gemma and the team. The cake truly made his party! I would like to thank Charlie for my fabulous birthday cake featuring sled dog huskies. My husband arranged the cake as a surprise for me and it was so lovely, it made me cry. It tasted really good too. Thank you once again. The Birthday cake looked good and tasted absolutely fabulous, even the "I don't eat cake" guests said it tasted so light and moist. Will definitely be recommending The Cakery, thank you very much. After asking for a superhero cake for my boyfriends birthday it was amazing to taste as it had vanilla inside and white icing on outside, very quick and efficient staff and would recommend to anyone. I'm going back again this year for another cake. Thank you for making a wedding cake for us at very short notice (after a bit of a disaster!) Thank you for being so lovely and helpful on the phone too and accommodating my requests. The best cakes I have ever had. Amazingly moist. I come from London, it's worth the journey. Recently they made a carousel cake for my nieces christening. We wanted the wow factor and they didn't disappoint I will be back next month for my daughter's birthday cake. Thank you so much. This is the third year I've had my grandson's birthday cake, as always a fantastic cake - many comments on how wonderful the cake was. Beautiful sponge as always. One happy grandson with his Ghostbusters cake, thank you so much. Thank you for an amazing Ruby Wedding Cake. Great design and taste was stunning! Everyone commented on how delicious it was - thoroughly recommend and will definitely use again when we next need a cake! Not to mention a very reasonable price too! Thank you!!! The cake for my granddaughter's 18th birthday was lovely to look at and tasted delicious. Would definitely recommend to friends. Thank you so much to everyone at the cakery for our amazing wedding cake! Gemma was so helpful and friendly as we weren't from the area. She stayed in touch throughout the planning process and the end result was exactly what we had dreamed of! Thank you Gemma for a really beautiful 21st birthday cake for our son. We loved the design and the taste was fantastic!